The reasonably-priced Farmhouse red first came to my attention because it was made by a family-owned California producer known for quality wines. But it hooked me when I found out that not only was the wine well-crafted and inexpensive, it also was produced using what the company that makes it calls “beyond sustainable” practices. 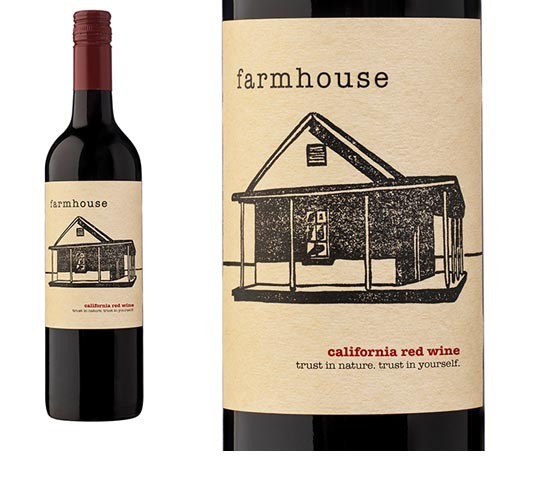 In a nod to the farming practice, Farmhouse wine is named for an old schoolhouse, pictured on the label, located at the 140-acre Green String Farm in Petaluma, Calif. (There’s already another well-established California label called “School House Vineyards.”) The rustic building serves as a library and study room for students from around the world who want to learn the Green String method of sustainable farming, an article on the company’s website says. Farmhouse red is a medium- to full-bodied wine made from a blend of grapes fermented in stainless steel and aged in medium toasted French oak for seven months. Winemaker Charlie Tsegeletos’ work begins in the vineyard, and he lets the grapes shine in his wines, using only a hint of oak to round out the flavor. Farmhouse red is a blend of 59 percent Zinfandel, 15 percent Syrah and 26 percent a blend of such other grapes as Carignane, Mourvedre and Petite Sirah. In his tasting notes, Tsegeletos (pronounced Seg-u-let-ose) describes Farmhouse red as a rich, balanced red wine that’s full of dark berry flavors and aromas with a smooth finish. I found it to be an excellent, affordable wine to have on its own or with a wide variety of foods, such as the silky beef and mushroom stew that my wife, Sandy, and I enjoyed recently with the wine. Farmhouse red is widely available in New England, but you might have to ask some wine merchants to order it. It’s a bargain at $12, but it’s regularly on sale for less. I found it for $8.99. The Cline Family owns vineyards throughout Contra Costa and Sonoma counties, growing Merlot, Chardonnay, Pinot Noir, Rhone varieties and Zinfandel grapes. Fred Cline was a founding member of California’s “Rhone Ranger” movement, a group of wine producers who focus on Rhone varieties. The company also is the largest holder of old-vine vineyards in the state, which are kept productive by the Cline Family agricultural practices. Fred Cline first made wine with his grandfather Valeriano Jacuzzi, who after emigrating from Italy, worked with his brothers to invent aviation propellers, well pumps and the hydro-massage spa that bears the Jacuzzi name. Cline took the $9,000 he inherited from the Jacuzzi family and $3,000 he had saved and opened his first winery, a rundown facility with vines that averaged 100 years old, the website says. The Green String farming method, which is used in the company’s vineyards and on the Green String Farm, keeps soil and plants healthy and free of pesticides and artificial chemicals to create a self-nourishing system where less human intervention grows better crops. The goal is to produce greater crop yields by using compost, compost tea and crushed volcanic rock and oyster shell mineral supplements. Half the crops are grown for human consumption and the other half for nature by using rotating cover crops that enrich the soil. Cline doesn’t use herbicides. Weeds are allowed to grow beside crops and vines, creating biodiversity, and when weeds become overzealous, they are mowed or eaten by the 1,500 sheep and goats that populate the vineyards and the farm. “You can drive for miles and never see weeds until you drive by Cline,” Fred Cline said in the article on the company’s site. Pests are controlled by nature and keeping the vines nutritionally balanced. If a plant is healthy, it will not get bugs, Cline said. In addition, the winery is 100 percent solar powered, reducing greenhouse gases by almost 700,000 pounds, the website says. Cline Family Cellars produces 33 wines that range in price from $12 to $70. The winery annually garners top awards and ratings for its broad variety of wines. Farmhouse California Red is a very nice everyday wine, and its production is blazing a trail for sustainable, environmentally-friendly farming. Cline also makes a Farmhouse white, but I haven’t yet seen it on the local market. In the meantime, check out the red. You won’t be sorry.